Plantgasm - We Have A Winner! Back in February, I picked up a few seeds in New York City park and took them home to San Francisco. I planted them in late March, and they sprouted in early April. I had no idea what they were, so I asked you to play Guess The Seed, and it turns out you’re a smart bunch. 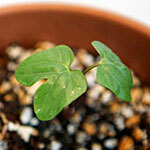 The most frequently posted answer was the right one: Morning Glory, aka Ipomoea purpurea. The vine has steadily climbed out of its pot and up an impromptu trellis (a bamboo stick I leaned against the wall). I was surprised to see flower buds on it last week, and, today, a bloom. ID confirmed! The funny thing is, the same kind of plant is currently growing on the fence not 10 feet away from this pot. These little guys traveled all the way across the country just to say hello to some cousins. Let’s Play Guess The Seed! If you can correctly guess the species of this plant, you win! 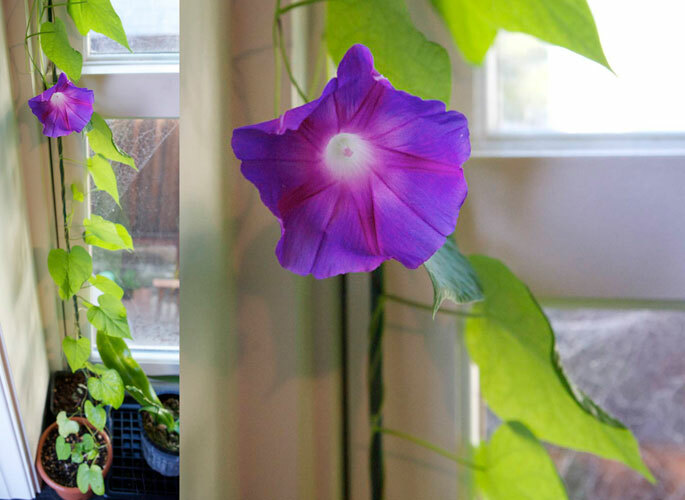 my ipomoea alba bloomed yesterday!